Nyaaaaa :3 I've made it just in time! Having an overtime last night was worth it! Duration: 1 week. I've started on this Monday...and worked on it little by little everyday. Too many homeworks for this week so can't spend too much time on Photoshop. I worked overtime on this last night since I really want to give this present on time...worked til 4 AM :P got too tired after that so all the finishing touches were done today. 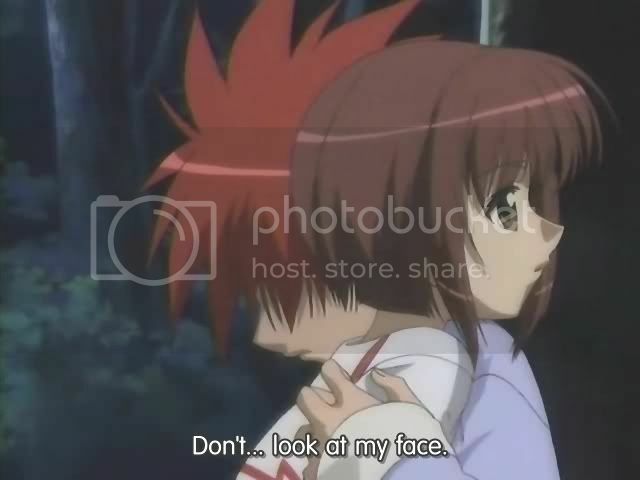 - Daisuke and Riku were vectored from this screenshot. This scene I really cute, and I liked the emotion here, makes me want a hug too xP.Vectoring small screenshot is really a pain with all those undistinguishable blurry outlines. Why Daisuke x Riku? haha from what I know, this is one of her fav couples. - marble textures used were from deviantART! How many vectors have you submitted? cause really I haven't submitted anything at all :P I've been on procrastination mode lately. Anyways lovely vector as usual Luna-chan, but the wings seem a bit off, I don't know how to explain it. Maybe you could have been the shades on the wings a bit more darker. But otherwise looking at the small un-detailed screenshot you worked with, I'll give you *hugs & throws confetti* since it's a whole lot of patience to work with that screenshot. This is so simple..I really wish I could've seen more details. More lines, more shadows. Like in your "When You Look Me in the Eyes" wall, for example. But I like the fact that you added the wings. Great addition! this is such a cute hugging scene. they're a perfect pair! i like niwa with white wings t0o! OMG i love it!I love DN-angel and this walppaper is just amazing! Romantic and adorable! They're one of my fav pairings too. I really like this scene. The wing add more to the whole romantic feel. There is an almost poetic and somehow emphatic quality to the characters generated by their demeanor and those red ribbons also helps to emphasize them superbly. Love the overall presentation and quality of the wallpaper!